I woke up at 6am on Monday – the staff nurse, clad in green, greeted me. He told me to take a bath and get into cotton whites by 730. I felt like the sacrificial lamb readied before halal. It was quite an awkward situation, the nurses were not used to seeing patients up and running before their surgery, “well, I am the patient”. At 745, two nurses put me on a trolley, and wheeled me to the OT. That is the first time I was on a trolley. All along people look down into you, sad look on their faces – if it was empathy, it sure was misplaced. 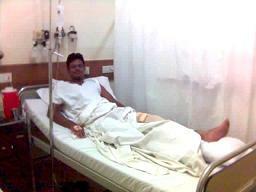 The OT in Manipal hospital is in the second floor, I was wheeled in through two sets of doors into the pre-op area. It was shift change over time for the nurses and I was privy to their ‘you-take-my-shift’, ‘landlords-demanding-more-rent’ gossip. For the next four hours, while I lay half awake (half, as in top half), Dr. Hemanth Kalyan (HK) and his team of surgeons worked on my torn Anterior Cruciate Ligament (ACL). The OT was a large room with loads of instruments, big boxes with colourful buttons. There must have been about 5 surgeons, 3 anesthetists and 2 nurses. I could recognize Dr. Nishida’s smile even from within the mouthpiece. As HK got his tools in place – the drill, the saw included, the anesthetist pierced my right hand for the IV and the drips came on. Then they pierced my lower back, the spine area for the anesthesia. In a few minutes, my legs started feeling heavy, and the feet felt as if there were a thousand ants swarming over them. I was told I could watch the surgery on a screen that was visible on my right side. The next thing I saw, a pale leg was being hoisted up by a couple of junior surgeons, it certainly didn’t feel like mine. A digital clock on my left read 8 something. There must have been some sedation injected intravenously coz I slept for about an hour. I can’t quite recollect the sequence, but I did hear a lot of noises – some scary, some good news, some shocking, some weird. I heard HK say a lot of pass-me-shaver, pass-the-saw, pass me this, pass me thats. I heard a lot of drilling, tapping noises. I could feel these vibrations in my bone. But since the pain was absent, it sent some confusing signals to my brain; it certainly didn’t feel like my leg that was being operated. There were n no. of times when HK reprimanded a junior surgeon, “don’t you have common sense”, “did I ask you to use your brain”, “don’t you know you have to get a sharp one”, etc, etc. My doddappa, Dr. K G Das, a cardiologist of high repute, told me that a lot of interesting conversations happen during a surgery. That would be quite an interesting compilation to get hold of. After a while, HK declared that the graft was ready. He even went on to explain the composition of the graft to his juniors. He asked for some marker ink, to color the graft, I presume. Then they started to set the Arthroscopy in place. It was a little later that I started to freak out. HK said, “there seems to be some problem here”. It turned out there was some problem with the source light of some kind. I had to resist my temptation to suggest some tricks myself, even as the surgeons were trying to fix the faulty source light. All kinds of options were being discussed – tilt it around, change of bulb, power cord, replacement of the light source itself. Yeah right, all this while my surgery was still on. Around noon, they got it working again. By now, the effect of my anesthesia was wearing off and I was able to feel a bit. By putting my neck out, I managed to catch the attention of the anesthetist (who appeared to be smsing or playing a game on his cell or something). HK informed them that there was at least another hour of surgery left and I had to be put on general anesthesia. I was made to breathe out of an inhaler. The next thing I remember, I was being wheeled out of the OT, with what felt like a real heavy bamboo sticks tied to my left leg and a dry and nauseating feeling in my throat. I looked at the clock in the post-op, it read 2:30 – lot of time and lot of memories, not a lot of pain, not just yet…. For the last four years the ligament has been troubling me, with mild pain after a long workout, run or walk. The earlier frequent buckling of the knee had now disappeared. I decided to get over with it, so I may be good again. When I started diagnosis with Dr. Kalyan, I was hoping it wouldn’t be a surgery, but then the MRI suggested no other option. There is loads of education item on ACL here. (It’s a good site for most medical queries, go check maadi.) It sure is worth a read. The latest is I am well on the path to recovery now, nearly 3 weeks after surgery. And should fit my running shoes in about 3 months from now. For the benefit of all those who are visiting the site and curious to know how things panned out, here's an update. I have had complete recovery as far as ACL surgery is concerned. Since then, I have completed about 17 marathons and 3 Ultra marathons and train pretty hard to be among the top 1% of most races in India. I had a follow up MRI done in 2010 and consulted with Dr. Hemanth Kalyan again, he remarked that the MRI showed good placement of the screws and the ACL intact. He also featured my progress back to normal life in a article that was published in The Week last year. Remember, the rehabilitation is perhaps more important than the surgery itself. Take care. Awright!..so the blog-runner (or running-blogger?) is back...not so much with a bang I suppose? (it might hurt the knee)...so how's the knee healing? That is by far the fastest comment on my Blog!!! The knee is healing good I shud say, it did take quite a beating at the physiotheary this morning, for the better, i am told..
Wow, that was a graphic description of your operation... All the tapping, screwing of your knees, just reading it sent shivers down my spine. I had such an experience at the dentist, two junior dentists were discussing about the hot new babe working under the head dentist, drilling my tooth all the while. When do I see through your viser again man?...hope all's well down under...I mean with your knee..:).. I would have been really scared to have been able to hear ppl talking during my surgery. Both times I had one - I was totally knocked out! Hey, hope you are doing well now. I live in Bangalore and planning to get an ACL reconstruction done similar to what you have got and wanted to chat with you about your experience and the procedures involved. Can you send me your number to ajay.gopinath AT gmail.com so that I can call you up? Doctor has advised no to surgery for the moment. i want your opinion as you already had acl reconstruction. that too after 4 years.... please do help me brother... i am worried and disturbed a lot.. I just wanted to ask you one question...will I be able to walk without any limping in 2.5 months time and be perfectly fit for my wedding? I am definitely ready to push myself and do aggressive rehab post-op but just need that one assurance on my will power... and who better than you to help me in this?